Canadian Prime Minister Stephen Harper has approved the Northern Gateway Pipeline which will ship oil from Alberta to the West Coast of British Colombia through some of the most pristine wilderness in Canada and through First Nations communities. 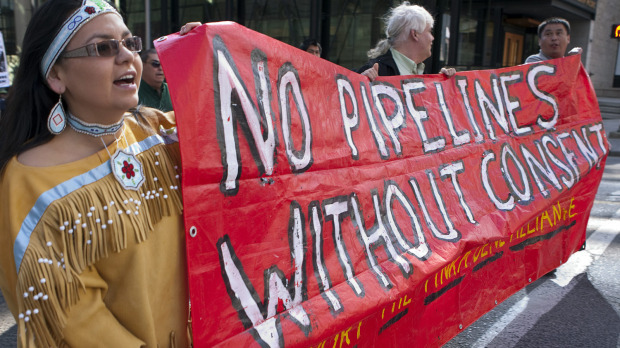 This pipeline along with Keystone XL have been hot topics for years now, with the Canadian government firmly on the side of drill baby drill. Gutting environmental assessments ensured that the pipeline would be approved without much trouble, and Harper continues to push President Obama to approve Keystone in spite of the fact that it won't create many jobs and could potentially cause massive amounts of environmental damage. It is pretty clear that Obama will reject Keystone after the congressional elections in November, but the reasons for doing so are obvious and sensible. Yet the Harper government fails to see this. Being ideologically blind has many consequences and this is clearly one of them. The science is telling us that these pipelines are not a good idea but all the Harper government sees is dollars and cents for their friends in the oil industry, who no doubt were the ones to conduct the environmental assessments. Common sense tells us that if a project is going to cause more harm than good we should probably abandon it and look for alternatives. But common sense seems to be lacking in the Harper camp. Like in the United States, pipelines and drilling and fracking have become political issues, and anyone who objects to further development is an environmental terrorist trying to ensure that we all pay more for gas and heating and oil. Similarly those on the left are expected to oppose development in all cases otherwise they are no better than the crazy Republicans or Conservatives. Showing your disdain or reverence for development is a badge of honor and a sign of your allegiance on the left or right. The problem with this approach is that it muddles up the real issue, which is the science and fact based analysis that should determine the effectiveness of pipelines or other sorts of development. Unfortunately big oil and politics have gotten in the way of unbiased and scientific assessment, and the true damage of these sorts of projects is never revealed until after there are horrific accidents like what happened in the Gulf of Mexico. The true effects of fracking are still unclear but are starting to emerge. This isn't about left and right. This is about the facts of what these projects do to the environment. It is hard to make an argument that more pipelines and more fracking will be good for the environment. They might be good for business, but in the end the average person won't see their bills go down, and the communities effected by the disasters that will inevitably accompany these projects will have to live with the consequences. This is why the First Nations of British Colombia are opposing the Northern Gateway pipeline, and will likely continue to push to stop it. They don't want disaster in their backyards. Who would?